Three students at Bangor University have come tops in ‘University Challenge’, a fierce pan-European translation competition offered by Veritas Language Solutions. The three students, who are all studying at Bangor University’s School of Modern Languages, have each won ‘Best Translators’ their respective language categories. The three are Christina Les, Liu Changjing and Matt Jellicoe. In order to seek out the brightest young linguistic minds, the Competition judged their translations of set pieces of literature on the accuracy of their grammar and spelling, evidence of cultural knowledge, use of appropriate language, use of register and tone and their clear comprehension of the provided text. 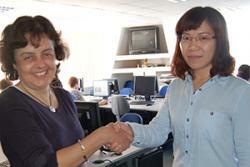 Christina Les, a mature student studying an MA in Translation Studies, won the translation from German to English. She said: "It's really exciting to be recognised for a skill I hope to use professionally, and I'm grateful for the support of our course tutor, Dr Yan Ying, who works really hard to promote Translation Studies at Bangor and always encourages us to get involved." After studying French and German at the University of Nottingham and working in France, Germany and Austria, Christina moved to north Wales to teach languages. She is now halfway through an MA in Translation Studies at Bangor University, learning Welsh and making the most of the beautiful surroundings. 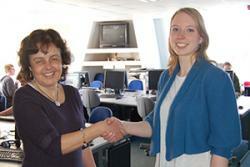 Christina was accepted on the Access to Masters programme to study at the School of Modern Languages. Liu Changjing won the English to Chinese category. She comes originally from Zhejiang in East China, but was attracted to Bangor University to study the MA in Translation Studies, aware that she would have a Chinese supervisor, and also aware of the UK’s great reputation for education. She was also awarded a School of Modern Languages International Scholarship. Liu is hoping to continue to PhD level and is currently awaiting confirmation of a China Scholarship Council Scholarship. The University is also to award her another Scholarship. Matt Jellicoe obviously has a flair for languages, having won the Chinese to English translation, having taught himself Chinese during the year before coming to University. 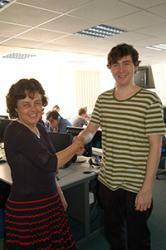 He is studying German and Linguistics and is in his final year at Bangor University. Matt, from Sollihull near Birmingham, and a former pupil of Arden School, Knowle, said “people shouldn’t be apprehensive about learning Chinese.” Although studying German and Linguistics, Matt persuaded the University to let him spend part of his year abroad in China practicing his Chinese as well as his German! “I do appreciate how flexible my study at Bangor has been and it was the only University where I could study German from the beginning as part of my degree.” says Matt. Bangor’s successful students are among 13 who receive a Certificate of Translation Excellence and a mentoring session from the company’s MD, Sharon Stephens, who will offer advice on working as a translator.